Amy here today to share a really fun card that can be used year round to send some love to those around you. The black tops of the banners are stamped in black ink. I then embossed the red heart banner beneath the black lines. 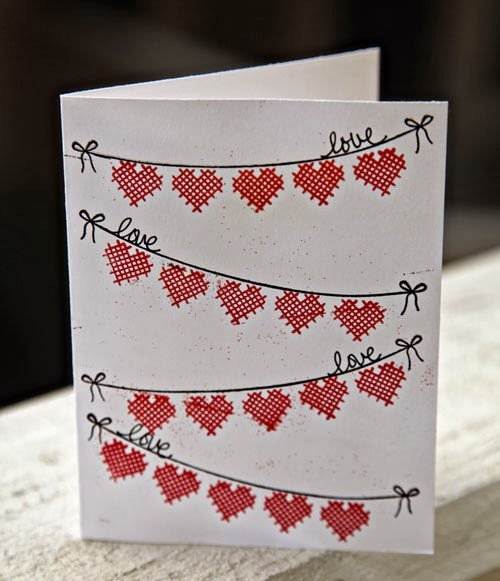 To finish off the card I wrote "love" onto the lines. But you could write or stamp any sentiment. This stamp set is so versatile and easy to work with. If you haven't tried heat embossing you should definitely give it a try. I love pulling out my heat gun and embossing powders and playing with ink and powders! I hope I have inspired you to stamp today and remember Heather for all your stamping needs! this is beautiful... love this stamp! !